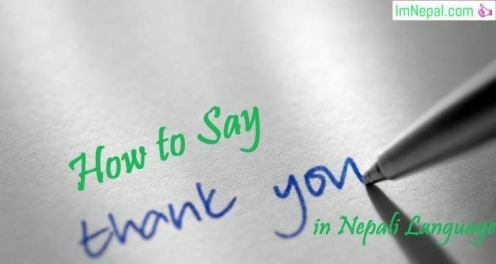 How to Say Thank You Very Much in Nepali Language: – Language is the means to express yourself and say those things that mere facial and gestures cannot do. Language plays a major role in extending your sincere thanks to the ones who are indebted to you. One of the most expressive languages that we have is Nepali language. With extensive vocabulary and unique tone of reciting or saying words, Nepal language is definitely one of the best languages in the world. Use of such extensive vocabulary can definitely help you in achieving the highest level of verbal communication. Saying Thank You to someone you are indebted to is indeed very important. Whenever someone helps you with pure intentions, then you ought to extend your sincere gratitude to him or her out of respect to the one helping you. There should be no shame in saying thank you to the ones helping you. There are lots of ways to express your gratitude. However, whenever you are saying Thank You in Nepal, you should be extra cautious and make sure you have right words of gratitude according to the person you are saying thanks to. So, in this article, I am going to let you know how you can use Nepali words to the people you are indebted to depending on the person you are saying thanks to. For example, the words of gratitude to your brother should be different from the ones to a stranger or to your professor. So, here’s few guidelines that will help you learn the craft of saying thanks to. If you are one of those lucky people to have love in life, then you must show your love to your girlfriend/ boyfriend every now and then. More than that, you need to tell them how much they mean to you and how much you are thankful to them for all the love, support and happiness due to their love. This is very polite and lovely way to thank your loved ones. So, if you have a girlfriend/boyfriend, make sure you politely thank him/her for every precious moment you have shared. Husband is the one person in every woman’s life who supports, loves and cares for his wife more than anyone else. It is very important to express your love and gratitude to your husband for continuous love support and wonderful moments. This is one of the best ways to express your gratitude to your husband. So, if you are a proud wife who loves her husband and is grateful for his love, support, and continuous care, then go ahead and express your sincere thanks and love to him. Make sure you say these words with lots of passion and expression. आसल गुरु भै सदा हाम्रो भबिस्य को लागि लडिरहने मेरो गुरु प्रति धेरै आभार ब्यक्त गर्न चाहन्छु. How to Pronounce in Nepali language: – Asal guru bhai sada hamro bhabisya ko lagi ladi rahane mero guru prati dherai aabhar byakt garan chahanchhu. A teacher is the one who is always passionate in making his pupils/ students the better person in life. Without teacher’s continuous help and support, no one can achieve his / her goal in life. So, it is very important that you show the gratitude to your teacher once a while. The line mentioned above can be very helpful if you are searching for polite words to make your teacher feel proud of you and make them realize the great work they are doing in life. Make sure your words are spoken politely and with lots of expression and gratitude. There are various instances in life when you need to be extremely thankful to a person who is unknown to you. For example, in case you are lost in the way and need to get somewhere, and a stranger helps you out in such situation, you must be very thankful to them. In that case, a simple Dhanyabad (thank you) word would be completely fine. This way, you can be thankful and grateful to the one helping you out in need. This word alone is powerful and can make you seem grateful. Saying thank you very much to a younger brother or sister can be very difficult at times considering the fact that they are younger in age. However, in some instances, younger brother or sister’s suggestion can lead your life to the right path and also help you out to achieve your dream. In such case, you need to be grateful to him/her and express your thankful notes. A simple Thank You (dhanyabad) can be extremely helpful in that case. Also, make sure you express how much you adore them at the end to make it even more memorable. Conveying the message of gratitude to elder brother or sister varies from the ones to mother or father. To your elder brother or sister, you can be grateful for their help, learning, and happiness. While saying thank you very much to your brother or sister in Nepali, rather than just saying ‘Dhanyabad’, you can make them realize them how much you admire their help, and learnings. You should first be grateful for their help and thank them for being with you in every moment or step of life. You should always address them with love, passion, and gratefulness. Mother is someone whom mare ‘Thank You’ is not enough to show the immense love and respect for her. She is the only person in the world whose love is pure towards her children and does not desire anything in return. However, every now and then you can make her realize how much you love her and respect her for all her sacrifice and happiness. You can be grateful to her to her for all her hard work in making you a better person every day. While saying thank you very much, you can first of all be grateful to her for all her sacrifices and also promise to become a better person in future as that would be her only desire in the world. hajur ko maya, sath ra samma ko kadar gardai hajur lai hardik dhanyabad bhanna chahanchhu. Your dad is someone who works all his life for the sake of his family. He makes sacrifices to make sure there is the smile on the face of his family. He dedicates his entire time to his family’s happiness. You must always feel lucky to have a father in life and more than that you need to give respect to him and be grateful to him every now and then to make his day. The above-mentioned statement in Nepal would be perfect if you are looking for words to show you love, gratitude and basically say thank you to your dad for all his hard works in making your life better each passing day. In this way, there are lots of ways to express your gratitude. However, whenever you are saying Thank You in Nepal, you should be extra cautious and make sure you have right words of gratitude according to the person you are saying thanks to. So, in this article, I have given you many ways to say thank you to the people you are indebted to depending on the person you are saying thanks to. For example, the words of gratitude to your brother should be different from the ones to a stranger or to your professor. So, depending on the ones you are saying thank you too, the worlds should vary. Hence, in this way you can say thank you to your near and dear ones whom you are fully indebted to. All these ways of saying Thank You varies as per the person and you need to learn to use them appropriately as Nepali is complex language.